Located in the midst of the major tourism area, and yet offering breathtaking views and architecture, the Dhsr Hvezda-Skalnik Marianske Lazne is a good choice for both leisure and business travelers to the city. It is within easy and comfortable walking distance of the golf course, Spa Colonnade, and Caroline's Spring, and is near the famous Singing Fountain and major local parks and belvederes (scenic overlooks) of the area as well. 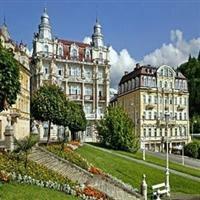 The Dhsr Hvezda-Skalnik Marianske Lazne is located at Goethovo Namesti 7 and is 19 miles from the Karlovy Vary International Airport. All of the bedrooms in the Dhsr Hvezda-Skalnik Marianske Lazne are outfitted with a minibar, a personal safe, satellite TV, high-speed Internet access, room service, and a full-sized bathroom with tub. Visitors to the Dhsr Hvezda-Skalnik Marianske Lazne will be able to rely on the many amenities which include the 24-hour front desk service, a lounge with bar service, laundry and dry cleaning services, pet friendly policies, a full-service tour desk, airport shuttles, a concierge desk, a modern fitness room, the spa with massage and beauty treatments, an in-house restaurant, a sauna, child care options, and a swimming pool.